Growing up, accessorizing was straight forward. Jewellery was simply earrings, chain, bracelet, ring, watches in traditional precious metals such as silver or gold and precious or semi precious stones. The most you worried about was what carat gold it was. In some instances it was a matter of inheriting a brooch or watch from your mother, grandmother etc. Now jewellery especially handmade jewellery has become more exotic, contemporary and chunkier made in a varying range of other metals such as copper and brass and materials like leather, clay and recycled material for example glass etc. Categories such as ethnic jewellery, african beaded jewellery, copper jewellery are just some of the new categories that exist now. 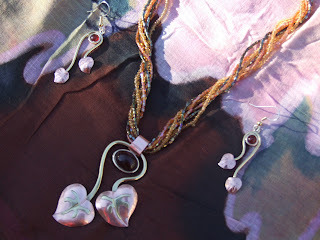 Some of you when thinking about copper jewellery are reminded of simple copper bracelets worn for medical purposes and may not be thinking about the trendy fashion accessory like this handmade copper jewellery gift set entitled "Grapevine" that makes the most unique jewellery gifts for her.